← Should we use Mantel tests in molecular ecology? Natural selection, and the adaptive evolution of hybrid reproductive incompatibilities post divergence are known to be major drivers of speciation. At the phenotype level, these manifest as fitness differences between introgressing populations. At the genomic level, speciation “genes” or “islands” are often identified via quantifying these incompatibilities as barriers to migration, and hybridization (see my previous post for an account of “islands” and secondary contact). Three recent publications discuss these incompatibilities in different contexts (1) genome wide scans of selection (Haasl and Peyseur 2015), (2) when incompatible gene flow post divergence does not increase selection (Rolshausen et al. 2015), and generally, (3) the genomic architecture of incompatibilities under secondary contact (Lindtke and Buerkle 2015). 1) Fifteen years of genome-wide scans for selection; trends, lessons, and unaddressed genetic sources of complication – Haasl and Peyseur, 2015, Molecular Ecology In this detailed meta-analysis and review of > 100 studies across a host of species, Haasl and Peyseur (a) discuss evolutionary processes – mutational rate differences among marker types, recombination rate variation across the genome, confounding effects of reduction in diversity due to linked/background selection and positive selection, selection on polygenic traits that often complicate, confound, or complement the identification of targets of selection, (b) report observed trends in GWSS across taxa –predominantly human, use Fst outlier detection, and strongly biased towards the detection of positive, and directional selection, and (c) offer recommendations for best practices for researchers working on GWSS – the use of recombination and mutation rates, and the use of simulations eg. under an ABC framework, to test hypotheses of demographic histories. The genome provides an organic record of evolution that is frequently likened to a palimpsest – a writing medium that is recycled, continuously written over, and reoriented so as to partially or wholly obscure older text. By this metaphor, chromosomes are the parchment, and DNA sequence the text. Rolshausen et al. report results of a long-term mark-recapture observational study on inlet (river/stream) and outlet (lake) populations of the threespine stickleback (Gasterosteus aculeatus) in British Columbia which have large levels of previously observed unidirectional (inlet-outlet) gene flow, and phenotypic differences in life histories. They monitor individual survival of ~4000 fish over long periods of time, with temporal replicates, and use logistic regression models to estimate selection coefficients. Key findings of the study include (a) increased winter mortality in outlet (lake) fish, (b) smaller average body lengths in inlet fish (river) compared to outlet fish (lake), (c) positive directional selection for deeper bodies in inlet fish, and no selection for body size in outlet fish, with seasonally varying levels of intensity – contrary to theory that suggests stronger selection in outlet fish (receiving maladaptive gene flow from the inlet). Of particular interest is the novel idea that high gene flow can causally reduce selection by broadening the fitness function – a result we demonstrated by means of a general population genetic model. 3) The genetic architecture of hybrid incompatibilities and their effect on barriers to introgression in secondary contact – Lindtke and Buerkle, 2015, Evolution Dobzhansky-Muller Incompatibilities, or DMI’s are often broken down in populations with few viable hybrids under secondary contact, but yet suffer reduced fitness. Lindtke and Buerkle use simulations of whole genomes in contact zones, to explore the classic DMI model, and an alternative model of coadaptation in genomes due to a ‘pathway’ model (wherein incompatibilities arise not from alleles, but from disruptions of pathway interactions). Quantifying Fst differences between diverged populations, they report (a) strong selection, and low migration showed the classic signatures of DMIs, and vice versa – weaker selection, and high migration indicated breakdown of DMI’s due to enabling interspecific recombination, and (b) genome-wide reduction in Fst under the pathway model, and declined linearly with time, with more introgression, stabilizing after a few generations, and (c) strong influence of demography – particularly migration rates on the genomic outcomes of hybridization. …This highlights the potential contribution of intra-genomic interactions to speciation with gene flow and suggests the value of a broader set of epistatic models in speciation research. 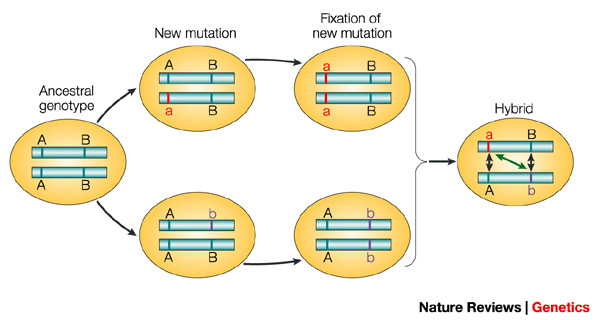 This entry was posted in adaptation, Coevolution, evolution, genomics, Molecular Ecology, the journal, mutation, natural history, population genetics, selection, speciation, theory and tagged ecological speciation, genomics, natural selection, population genetics, population structure. Bookmark the permalink.